Finally the arrival of Part 3 of my SQL Snack Pack on Performance Tuning! The series is dedicated to help beginners understand how to start performance tuning with SQL Server. The first video was about performing a baseline using the PAL tool.I would highly recommend you review that video as well as my SQL Snack on Instant File Initialization. Also, if you missed part two from yesterday you can review it here. If you are still interested in learning more about Performance tuning with SQL Server, I will be giving an hour long presentation with the PASS DBA Fundamentals Virtual Chapter on January 6, 2015 (11 am Central Time/Noon Eastern Time). 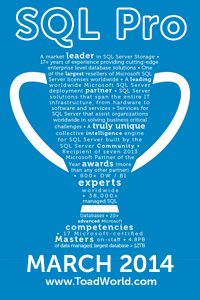 For more information please visit http://dbafundamentals.sqlpass.org/ and join PASS for a great way to learn more about SQL Server. ---  CPU time = 16 ms,  elapsed time = 2632 ms.
--CPU time = 0 ms,  elapsed time = 164 ms.